Seeing the news about Aleppo and the appointment of Steve Bannon as Trump’s right-hand man, I couldn’t help thinking about the most recent revival of Fiddler on the Roof. The new staging of this classic musical reminds audiences of modern-day refugee crises and humanizes these huddled masses. No other show on Broadway is even tangentially addressing this humanitarian disaster. Fiddler on the Roof also educates audiences about Judaism and the traditions that held these Jewish communities together. With the media normalizing white supremacy and re-branding its views as “alt-right,” understanding the history of anti-Semitism and the persecution of the Jewish people is the only way we can stop this irrational hate. Last year when I wrote Trunch 4 Trump, I honestly had no idea that Trump would become the Republican nominee, much less become the president elect. I wrote it because I thought this man was so ridiculous, he belonged alongside such outrageous villains as Agatha Trunchbull. 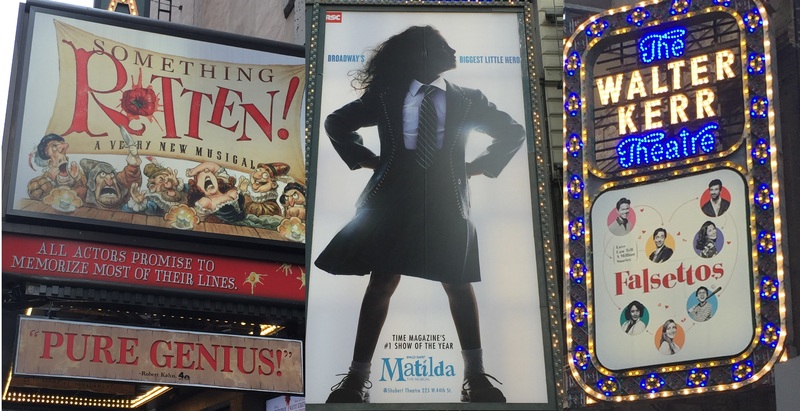 The fact that Matilda closed mere weeks before Donald Trump’s inauguration is depressing. This man is a bully and a coward, and it was a small comfort that eight times a week, Matilda reminded audiences that his behavior is “not right” and that “even if you’re little, you can do a lot.” I loved that on Broadway, a little girl like Matilda could be the hero of her own story, someone who stood up for reading and learning and stood against complacency and cruelty. She is the kind of hero that women and men, young and old, will need in the years ahead. The mantra of “Make America Great Again” meant many things to Trump supporters, and for some, it represented a return to the “traditional” family unit. Mother, father, two children, a dog, and a white picket fence. Falsettos turned that notion on its head and gave audiences a different kind of American family, every bit as real and valid and loving as the “traditional” family. Marvin, Whizzer, Trina, Mendel, and Jason aren’t perfect. Like all families, they fight and have their disagreements. When times get tough, however, they look out for each other and show true love. Maybe if more traditionalists see families like Marvin’s, they will see what all these different families have in common. They might understand that all of these families – gay straight, and everything in between – are real American families. They are not a threat, and this country is big enough for all of us. At the center of The Color Purple are strong, tenacious, and passionate black women – several of whom are also queer – and the main conflict is taking back their power from the men in their lives who try to control them. I believe I have inside of me everything that I need to live a bountiful life. With all the love alive in me, I’ll stand as tall as the tallest tree. But most of all I’m thankful for loving who I really am. Yeah, Broadway forever needs The Color Purple, no question, but the world especially needs The Color Purple in 2017. Humanity needs more Celies and less Misters. Something Rotten! isn’t a heavy or serious show. It doesn’t tackle hard topics or reinvent the wheel as far as musical theatre is concerned, but Something Rotten! is fun. What this show offered was levity and irreverence, and sometimes what a person really needs is a laugh and a crowd-pleasing musical romp. Click here to check out all the musicals and plays that are currently open on Broadway, and stay tuned to Ludus NYC on Facebook and Twitter for more of the best New York City theatre on Broadway, off-Broadway, and everything in between.